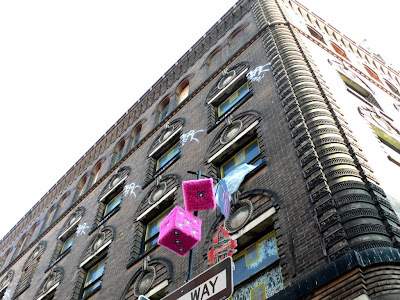 This was a large, community sponsored art project at 11Spring Street. It's a sterile condo now, of course, but back in '06 the developers agreed to allow the graffitti inside the building to remain, and sealed it up in the walls....forever...like a time capsule. I wonder what people will think when they find that hidden in the walls years from now. Great shots. I want to like all this but honestly KM, I just don't. We'll just agree to disagree on this one OK? I'm not a grafitti aficionado. Perhaps it's my age?? NAH, no way. In the shooting gallery. Looks hostile. So, did they just reface these outer walls with the grafitti intact or was there grafitti inside, too, that they put drywall over? Fascinating stuff, Ken. I always wanted to see the NYC subway trains in the 70s, when they were still covered with grafitti. Virginia, I am not crazy about a lot of the work here either but I think it's because it got slammed with amateurs and a bunch of people looking for exposure. 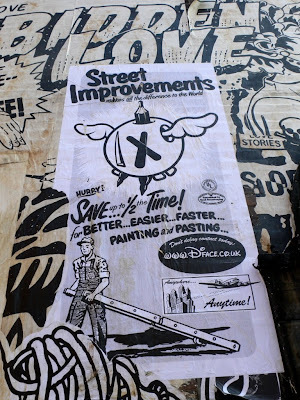 I lived on Spring Street for over ten years (one of those years at #10 - directly across the street) and this building was one of the best places to spot new wheat paste art and stencil graffiti. 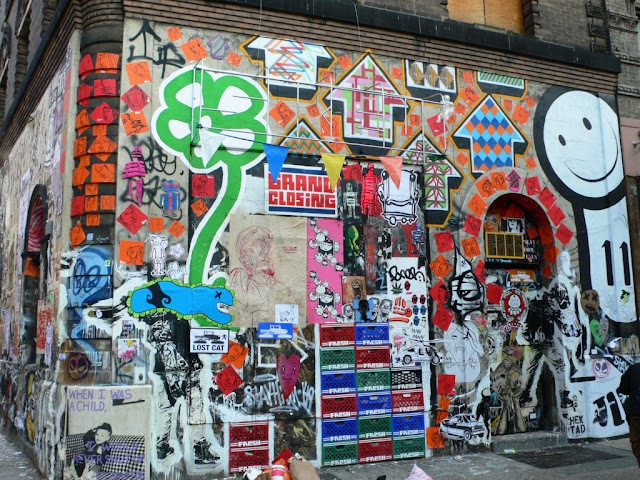 There was some very beautiful and thoughtful work posted on this building over the years by artists who came from around the world to post/paste here. The previous owner and inhabitant was an inventor who really kept to himself and didn't get involved with what was pasted to his walls. When he sold the place they had a last dance, so to speak, and a lot of bad art showed up and drowned out some of the really good work. It was very cool to walk through on the inside though. Boy, I'm a big mouth! Love it! Wonderful menagerie of things. I think some of this art is fantastic!! I think I've read about this building before but I recalled something more lively, more colorful. Maybe it was before your pictures. Virginia, I think these group wall art pieces are best appreciated in situ. It's sort of a collection of vignettes, a patchwork of solo performances. I see it a bit like jazz: the whole thing is very cahotic until you get wrapped into it, with solo highlights that can be pure little treasures, and improvised additions, hits and misses. I totally agree! 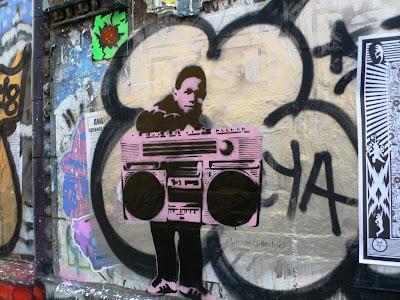 I think graffiti used to scare and intimidate me - it told me criminals were afoot. And now I see art and a craft and I enjoy trying to understand the message. I like to think about what graffiti artists will look like 400 hundred years from now when their "frescoes" will be uncovered, painstakingly preserved, and shipped halfway around the world. Like you, Ken, sometimes I look at a door that is just coated with stickers and tags and it pulls me in and I find so many interesting images. BTW, I think the wheat pasters who used to tag 11 Spring are doing quite a bit in Chelsea now near the West Side Highway. There is a wolf one up now that is beautiful. I take it back: i took a second look and definitely recall the 5th one. Best part! Very Impressive! Makes Long Island's graffiti pale by comparison! crazy how much has changed in just a few short years! 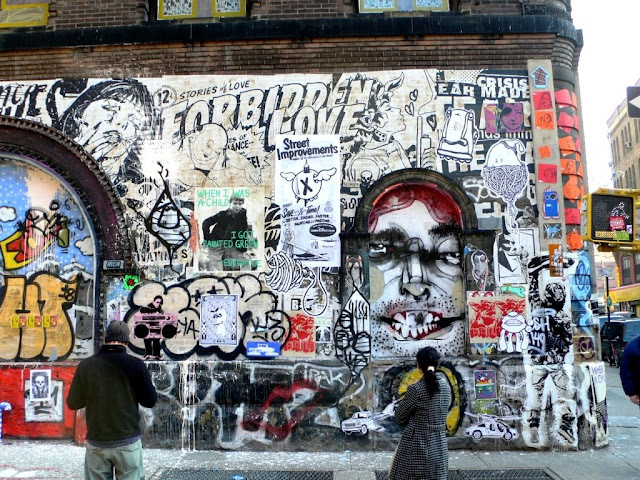 The colors are so vivid that the graffiti almost appears to be added to the photo after the fact. All art has it's place... to bad they can't scrape this off the walls and place it in an art museum somewhere, but then I guess it would not be graffiti now would it? I really need to get downtown more. Tumbling Dice thrown by sticky fingers for me. Graffiti is subjective and I am always caught on the hop. I'll go yes with this for the time capsule it is. I actually miss not having much here. You can be too sanitized. Thanks for sharing these. They are uplifting. And, for the record, I refuse to give up childish things. And you can't make me. 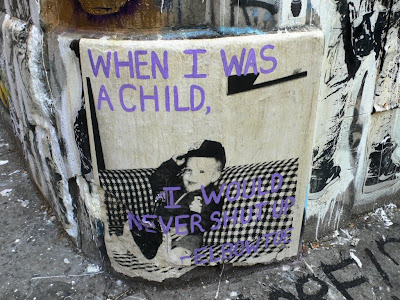 Love the quote on the last shot "when I was a child I would never shut up".... who does that sound like?? I miss that NY so much. I miss the shadow people of the 70's and 80's. I loved the graffitied trains, each car completely painted in bold bright colors during the 1970s, all around nyc! I used to call them the circus trains.